Asthmatics often fall into a vicious circle of avoiding activities that need them to exert. Muscles which are under-utilized do not maintain their optimum strength. (A classic example of the “Used Less becoming Useless”) This again leads to you getting more breathless and further avoiding even moderately strenuous activities. Exercises to change the pattern of breathing (Breathing Re-Training). Exercises to increase the strength of muscles involved in breathing. Exercises to improve your posture and flexibility of your breathing apparatus. The breathing re-training exercises for asthma have proven to be the most useful and are most widely practiced. The membranes that line our nose are designed to humidify and give warmth to the air that we breathe in. It also filters the air that goes into our lungs. Though you may tend to breathe through your mouth during an episode of asthma, do make it a point to breathe through your nose whenever possible. If you have any other conditions of the nose like frequent colds or allergies that causes you to have a stuffy nose, do get treatment for it. 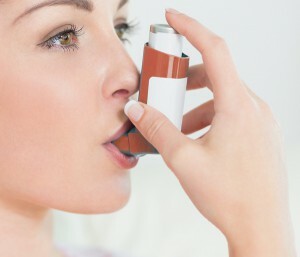 A study found that increase in asthma symptoms may have an association with mouth breathing. Take a breath in through your nose for approximately two seconds. Position your mouth in such a way like you would do to blow out candles on your birthday cake. Breathe out slowly through your pursed lips, making sure that you take twice or thrice the time you took to breathe in (about 4-6 seconds). This will ensure that your airways stay open for a longer period of time and more stale air is thrown out. You can also do this exercise whenever you fall short of breath during exertion. The diaphragm is a muscular partition that separates the chest and abdomen and helps to push out the air from the chest during breathing. In asthmatics, when your diaphragm does not work optimally, your neck, shoulder and back muscles try to pitch in, but they are not as effective. Doing the below exercise will help train your diaphragm to work more. Relax your shoulders and sit back or lie down. Place one hand on your abdomen and the other on your chest. Breathe in through your nose. While you do this, your abdomen should move in the outward direction and more than your chest. After about 2 seconds of taking a breath in, slowly breathe out through pursed lips. While you do this, apply gentle pressure on your abdomen to help push your diaphragm upwards. Repeat this. You have shared an informative post about breathing exercises that assist in the asthma treatment. Thanks!